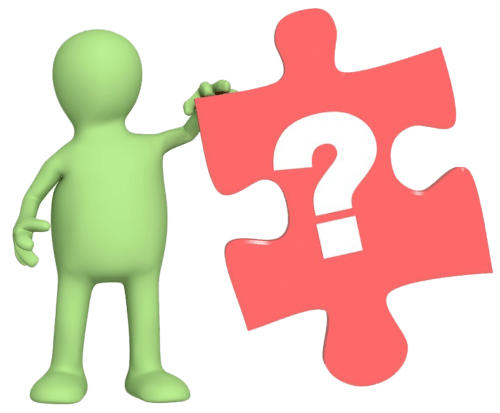 Do you value P4C but struggle to fit it in? You know enough about P4C to think it would be good for your school. But there are obstacles to implementing it. Traditional one-hour stand-alone sessions won’t fit your timetable. Teaching staff, already under pressure, are wary of taking on “yet another thing” and aren’t sure if they’re “doing it right”. 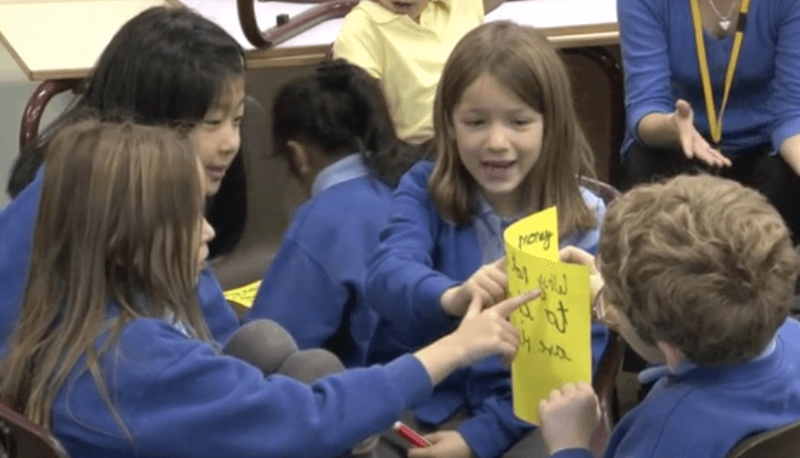 So how can P4C training support colleagues to make it work with your existing curriculum? Why book a Philosopher in Residence? When you book one of us as your "Philosopher in Residence", teachers see P4C in action before giving it a go themselves using our resources and with our support. 2. Teachers observe the range of ways they can use the Philosophy Circles method in their curriculum, and feel inspired to try it out themselves. 3. Teachers immediately embed P4C into their practice by running their own sessions, under our guidance and using our tried and tested Philosophy Circles resources. There's no case of "I'll get round to that one day..."
...but whilst sitting in a session led by Tom I couldn’t help feeling that here was something new and of superior standing. Philosophy Circles is like a magic portal (dare I say TARDIS….bigger on the inside!). I've been carrying it around in my handbag for months. Just 50 pages but packed with an ever expanding wealth of resources and don’t get me started on what it feels like when you try them out in class. As the book says ‘take the road less travelled’ and it will make ALL the difference to your class!" How does "A Philosopher in Residence" work? We have a Skype or phone call with you to discuss your school’s context and the priorities you have for philosophy. 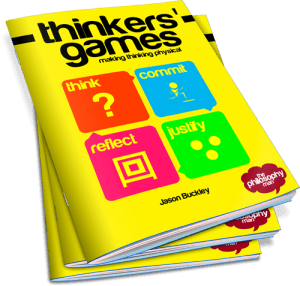 The minibooks included with the course – up to thirty copies of Philosophy Circles and Thinkers’ Games are sent to you in advance, along with a brief video introduction from us to your staff. Your staff try out some taster activities with their pupils. These are sent over in advance, tailored to each year group. They are designed so that they can be run without specialist training in Philosophy Circles by any classroom teacher. We deliver a day full of pupil workshops, followed by a twilight INSET introducing the key principles of Philosophy Circles, and demonstrating some of the activities the teachers will use in their sessions. A whole school assembly can be included to build some anticipation among the pupils and introduce what philosophy is. ...we run another set of workshops demonstrating answers to their questions. This is followed by another twilight focused on questioning skills that are useful across teaching, not just within philosophy sessions. Your staff run further sessions with the plans provided. By now, those who have observed a lesson each time, attended a programme and recorded some brief notes will be close to claiming their Philosophy Circles Level 1 Accreditation. Another full day of workshops and twilight – this time, the option is open for staff to be observed or to team-teach and receive constructive feedback. In the third twilight, we’ll look at how to plan your own sessions – although your school will have access to the full suite of Philosophy Circles plans for common topics in the curriculum (160 as of Jan 2018, plus 39 Spot and Stripe videos for Early Years, and growing). If you opt to continue your residency (subject to availability) the content of each visit and the support in between will evolve to meet your needs – coaching, curriculum clinics, training of pupil facilitators and so on may be involved. More and more children arrive in reception scarcely talking at all. Parents distracted by social media speak less to their children, and the impact is growing. In one school with many younger parents, children joining reception completely nonverbal rose from five, to half to the class. With the ever-increasing pressure from above, teachers feel more and more accountable for planning every minute of children’s learning. It creates a dependency culture, with children always looking to the teacher. Learn how planning less and letting the questions do the work fosters greater independence and faster progress. During a "Residency", teachers can see how easy it is to embed P4C, and immediately give it a go themselves. There's no wondering of "where am I going to fit this in?" or "I'll do this soon" and it never see the light of day. Handouts from training courses often sit in the "INSET graveyard'. It's full of ideas that sounded great on the day but which never quite got passed on to colleagues. Teachers are very busy, and so new initiatives often get buried under the hectic pace of day to day teaching. To avoid that, each booking includes attractive minibooks that are written with busy teachers in mind, and following the "Residency" our huge range of resources means there's every support for you and colleagues continue using P4C regularly. The books have memory aids in the form of stories, summaries and catchily-named activities so that it is easy for colleagues to make it part of their general teaching style. Any Philosopher in Residence booking includes our Premium Pack of Resources - 150+ 30 minute sessions on the most popular primary school topics. It makes it another, richer way to do what you do already, rather than something else to squeeze in. ...to enquiry footage with commentary. Much primary school training is focused on KS2, with Early Years teachers left to adapt as they can. Our sequence of a year’s worth of professionally filmed “Spot and Stripe” videos provide the perfect introduction to philosophy for younger children, introducing children to discussion and argument through colourful, fun characters and irresistible questions. These resources are absolutely superb. I've been trying/failing to use my imagination to get our girls more interested in this kind of thing. After using various books, an outside speaker and my own imagination I've made a tiny bit of progress, but your exercises captured the girls' imagination much more quickly. Great stuff. Just wanted to thank you for all the resources you have created/sent to me/posted. They're great and I'm using them weekly with my class. Can I start by saying how fantastic I think your ideas are - I really enjoy getting your emails and my Y6 class and I have really enjoyed using many of your stimulating resources. Recently, we spent all afternoon philosophising following your 'should Russia be sent home from the euros?' stimulus - kept my lively class engaged for hours. So huge thanks! Suddenly remembered that I have an inbox full of your emails and I have found so many good resources for kick starting discussions and debate. I am planning this lessons for year 7 form tutors (mainly PE, Maths and Economics teachers) so it has been really useful to have interesting resources to build on. There is definitely a buzz with your P4C materials with my current class and colleagues, which is all down to you. Thank you so very much for your wonderful P4C resources. I will prepare the sessions during the summer holidays in case I find another school who would like P4C before then. These first lesson examples you have so kindly shared will be really useful and I just wanted to say a big thank you to you for your generosity of spirit. This will really help me to get going. I wanted to send you a thankyou as i have bee4n completing a research project in school this year and your emails inspired me to create a philosophy SOW for my year 8s. I wish to say a most heartfelt thank you to you as I used some of your exercises as part of a mini project and it has had tremendous feedback both from staff at my school and from tutors at university. I really appreciated you taking time out from your busy schedule to help me. I just wanted to say a huge thank you for your emails, I am finding them to be more useful than the majority of the information that I paid to have access to! I have only just started a P4C group as a volunteer at my children's school, my enthusiasm is by far more dominant than my experience and your emails are a really valuable guide. I just want to thank you for all the P4C resources that you have been emailing me. Our school uses them regularly as we conduct P4C throughout our primary school from foundation to year 6 once a fortnight. Most of our staff are quite new to P4C so your resources have been greatly appreciated. A note to thank you for the resources you send weekly. A few years ago I did the SAPRE level 1 P4C course and practiced it for a short while. However my interest has been revamped since recieving your weekly resources and I have now begun to practice it again with the year 6 class that I teach once a week. I am now in senior management and am encouraging others to take this up by observing my sessions and passing on your resources to teachers of older pupils in the school. Your hard work is much appreciated. Many thanks. Thankyou Jason for all these fabulous resources, as a Headteacher of a small primary you have given me so much to work with. Thank you for the either ories stimulus, it was just what I needed to get my reception class really engaged with philosophy. Our final episode involved arriving back at the port and being offered the opportunity to stay and continue exploring or to go home. They absolutely loved it and we are following it up today. Thank you so much for your email and the inspirational attachments! I left the first 'Would You Rather...?' (bear/snake/monkey) for PPA cover for my Y1 class this morning with very clear instructions on how it should be used and returned to find my TA and class incredibly positive about talking about their feelings and able to articulate their thoughts much more clearly! A major breakthrough in a class that has found the transition to KS1 very hard so far, even with me as an experienced EYFS/KS1 teacher!! They are immediately more confident in talking through their thinking and gave clear and eager explanations all afternoon! Let's hope they can continue to develop their deeper thinking and reasoning skills and the confidence to participate more! Many thanks for all of your wonderful resources which you have kindly sent to me over the past 18 months. I have thoroughly appreciated all the help and inspiration you have given me. It has been invaluable. Thanks a lot for all the good material and great ideas. I've been working in Philosophy for Children in Porto, Portugal, since 2015 and I'm getting even more enthusiastic with your help. Actually, last week i was making some research online about icebreakers and other games to apply with the children, and then i received from you some good examples to try in class. Coincidence? Maybe, maybe not! Thank you for your posts. They have been inspiring, giving me lots to think about and share.They put a new slant on everyday situations, real depth rather than the usual superficial conversations. "All the positive testimonials provided by other schools was certainly a winning factor for us. The P4C training and workshops were simply outstanding." I inherited my role as P4C coordinator from my colleague who tasked me with planning a Philosophy Day. I had looked at several workshops and was pleased to stumble across The Philosophy Man website. All the positive testimonials provided by other schools was certainly a winning factor for us. The training and workshops were simply outstanding. All the staff had basic P4C training but did not know how to use it within their classrooms. This then acted as a CPD opportunity for all staff and this was furthered in the staff meeting. There was a buzz during the staff meeting, which for any member of staff attending a staff meeting at the end of a half term, knows this is a rare thing! All the staff said how enthused and excited they felt to get back into their classrooms and try out the methods they had been shown. After the workshops, I interviewed some children about their experience. I deliberately picked children who really struggle with the academic side of school life. One child, who had a workshop on bargaining for his life against a Mayan tribe, said “I loved the P4C workshop. It was so much fun to think of reasons why my life was valuable and the best part was, we didn't have to do any work!”. The children saw the workshops as a chance to express themselves. Thank you so much for inspiring us to continue with the exemplary training you provided and we look forward to working with you in the future! This all sounds great, but what will OFSTED say? With the relentless focus on data, everything schools do has to show an impact on maths and literacy. Fortunately, not only does OFSTED look very favourable on Philosophy for Children, but a recent EEF study demonstrated that it had a positive impact on both maths and literacy scores. We are excited about philosophy for its own sake, but it’s nice to know that it has a benefit for measurable outcomes, and in particular that it helps to diminish the difference between disadvantaged children and their peers. The school advises and supports other schools in the use of philosophy with children. This exemplary practice is spreading throughout the school and is having a positive impact on pupils ‘communication and thinking skills and this is beginning to be reflected in their achievement. In an excellent philosophy lesson in the nursery children were challenged to think about the characteristics of two imaginary characters and whether they would change depending on their facial expressions or on what they wear. The curriculum is broad and balanced and meets pupils’ needs well, including the excellent promotion of their spiritual, moral, social and cultural development and philosophy. "Several individuals, who usually find it challenging to share their ideas, came to the fore during the big discussions." "It has been fascinating to watch the children engage with a range of challenging topics with maturity, enthusiasm and empathy thanks to the facilitation provided by Tom. Their curiosity was inspired by the thought-provoking stimuli in each session and several individuals, who usually find it challenging to share their ideas, came to the fore during the big discussions. Since commencing P4C, we have noticed a dramatic increase in the children’s ability to discuss concepts with their peers and they have vastly improved in their ability in looking at one another when speaking, in actively listening to one another and in building upon and challenging others’ views and opinions. Before the lessons started, the children were not listening deeply to one another and responding to one another constructively – they had their opinion and that was it. We have also noticed an increase in confidence and concentration. The children’s critical reasoning skills were also developed; children were starting to support their views with reasons. Who is the villain in Macbeth? Who is responsible for King Duncan’s death? Was the Highwayman guilty of any crime? Is jealousy an acceptable motive for murder? Can murder ever be justified? 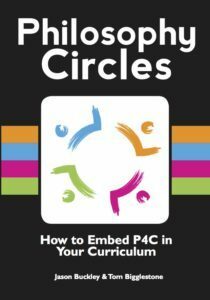 As teachers, we are excited about working elements of P4C into our day-to-day classroom practice, particularly when creating and discussing questions during class reading sessions." "I loved the idea of 'going into orbit'; I wasn't sure how it would go but yet again my pupils have proved me wrong and they were absolutely amazing!" As a SEN school it can be quite frustrating to attend courses that only focus on mainstream schools. The wonderful thing about Jason and Tom's training was that I felt not only could I use all the ideas in my school but also that pupils with special educational needs have absolutely been considered in their approach. I have used a number of ideas and resources from The Philosophy Man website with our pupils and have been so impressed with the positive effect it has had on the communication skills of all but especially those on the autism spectrum. I highly recommend this training to any teaching professionals as I feel it provides a fantastic opportunity to support pupils' emotional, social and academic progress. Thanks again for a fantastic training session and for your brilliant website. Immediately following the training I ran a communication group session based on the pirate thinkers game. I had a group of 15 pupils aged between 10 and 15 with a range of special needs but mostly on the autism spectrum. I explained to them that they we were pirates who had been shipwrecked and that myself and my TA had been swept away on a piece of driftwood so they had to decide who their new leader was. I loved the idea of 'going into orbit'; I wasn't sure how it would go but yet again my pupils have proved me wrong and they were absolutely amazing! Am definitely going to plan more sessions that allow for pupil independence. We have been doing philosophy in school for 2 years now and I was mindful of what Tom said about having to pump up a football before you play with it; this is so true of my pupils. We have worked with them to give them strategies for effective communication, debate and decision making so to watch them put those skills into action with no adult input was just amazing! "The day more than met our expectations – we were thrilled, and feedback was terrific"
I knew staff would be keen to learn something new, and the communication was excellent. The day more than met our expectations – we were thrilled, and feedback was terrific. Even the staunchest and hardest colleague who really doesn’t like group participation was very impressed at the end, suggesting this would be really key for the launch of our new Bacc. The half day worked perfectly for us, and I can see how it is readily adaptable for a whole-day too. Staff were very engaged from my view, and have embraced more of it already. Some good feedback and photos of it in action during RS and PSCHE lessons this week already. We plan to embed it firmly into PSCHE curriculum long-term , and to use the resources across RS, History, Geography as well as a stand-alone in form time at the very least. "I have to admit, it was one of my favourite PD lessons and having used it with students properly in a lesson, I can now see more applications for it within my own teaching"
A colleague tried out the continuum that she wrote yesterday afternoon and reported back how powerful it was to promote discussion and to get the children thinking about the topic of consent. She was really impressed with their level of maturity, questions and ideas and the way that the students opened up about some of the trickier topics that they had to discuss as result of the freedom that the task offered. I tried out lots of things and we did some pointing at stuff, which the children loved, followed by a 3 question thingy 'which is better, cats or dogs', 'Love is different for boys and girls' and 'relationships are easy'. We had some really powerful discussions and the students really enjoyed it. We then continued with me pointing out to them that the biggest thing they had spoken about was trust, so we got out a blue giant lego block as a talking piece and debated 'trust is the most important thing in a relationship' - very cool indeed and the students easily filled an hour without even realising. I have to admit, it was one of my favourite PD lessons and having used it with students properly in a lesson, I can now see more applications for it within my own teaching. I even thought of a tricky question to pose to my top set 'photosynthesis is more important than respiration'. This could promote a very interesting discussion indeed, which would lead on to a 6-mark summary which compares the two equations and their differences. "Never have I been on a whole day's training in which the hours actually fly by too quickly. I cannot recommend this p4c training highly enough!" I really liked the fact that it was so interactive with constant practical examples - actually doing things and feeling what the activities feel like and what they bring out in terms of thinking. It was great fun too and very inspiring. In fact I couldn't believe how quickly the whole day went - it flew by because it was so interesting, fun and inspiring. I am a huge fan of P4C and I think your Philosophy Circles approach is not only beautifully simple but beautifully effective too. 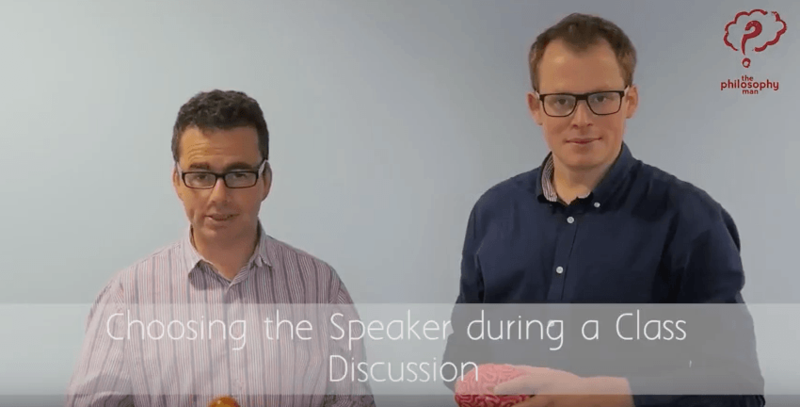 Jason and Tom deliver a totally wonderful day's experience of Philosophy Circles and I say 'experience' because the course is packed full of practical activities - inspiring ideas which are shared and experimented with in an atmosphere of co-creative fun. Never have I been on a whole day's training in which the hours actually fly by too quickly - I am greedy for more! The Philosophy Circles approach makes the inclusion of a philosophical dimension into everyday teaching easy, flexible and totally possible without being a burden in terms of preparation, planning or time management of the curriculum. It can be incorporated into virtually any topic or subject, can be slotted in, take main stage or sit there waiting in the wings for those impromptu moments. Learning how to apply the Philosophy Circles approach is key. Mind-expanding and so much fun - Jason and Tom will give you the tools to put Philosophy Circles into action immediately. I cannot recommend this p4c training highly enough. Before the training, I didn't have any knowledge to the depths P4C could go with children's thinking. Before the training, I wasn't familiar with the concept of the sessions and what each session could help the children achieve. I didn't have any knowledge to the depths P4C could go with children's thinking. The training was brilliant. I really enjoyed taking part in the activities, as they gave you a good insight in the potential outcomes and focuses throughout a session. The training provided and explained a variety of stimuli and games, which fed into discussing the structure of a P4C session. The training allowed the adult to step into a child's shoes when taking part in an activity and this enabled us to gain a clear understanding and experience of how a child might feel and what they might be thinking in certain situations, especially if they are unfamiliar to inquiries. Our school have allocated slots during teacher's planning time, where we carry out P4C across the school (EY's-KS2). We use many of the resources that were provided on the training and resources sent via email to assist our teaching. We have generated displays and scrap books to display the children's work, discussions, stimuli and photos of the sessions. The continuous support through email is brilliant and is helping massively. Who will be your Philosopher in Residence? The Founder and Director of The Philosophy Man. A life-long philosopher and former teacher, English, Jason is now an internationally renowned trainer, writer and speaker on P4C, classroom dialogue and stretching the more-able. He is author of two books, with more in the pipeline. He is also an outdoor educator, storyteller and improviser, and all these skills come together in his lively training, with minimum of Death by PowerPoint. Tom's courses are incredibly well-received thanks to his several years’ teaching experience. He has been Head of Department at both primary and secondary level, and in both the maintained and private sector. He has specialised for several years in P4C, and in 2014 was awarded The Walter Hines Page scholarship, for which he spent time in the United States researching assessment of philosophical skills. He brings his vast classroom experience and know-how into his energetic and interactive training. Both Jason and Tom are now taking bookings for Spring and Summer Term 2018. Please contact us using the form below, or the LiveChat box in the corner of your screen, if you'd like to one of six schools to take this opportunity.